Building your Wooden Doll House Today? Want the Best Plans Available? Your wooden structure seems to be the most imaginative and creative of all types of plans. Mostly because of the versatility of wood. You can build anything you see in real life in miniature with wood. Of course, this is also subject to an individual's preferences. You may think creating in plastic canvas, polymer clay or any other medium the ultimate material for your dollshouse. Nothing says you can not go with what you envision and succeed at making the best structure of all time regardless of the material used. But for my choice, I love working with wood. Does Working with Wood Intimidate You? Wood may be intimidating because of the amount of skill you "think" you need to accomplish what you desire. But don't let that stop you. Be willing to try new areas and add to your own knowledge base. The planning stage of your doll's home is the most crucial. This is where you will determine what you really want in constructing your mini mansion in the first place. Investing in a good design software also helps very much. With a software program such as Chief Architect you can experiment to your hearts content without cutting a single piece of wood. This particular program even has the ability to let you see your vision in 3D. I can not state enough the need to work out your ideas the best you can for your most amazing creation yet. Why settle for less. Also get into great communities online that deal in woodworking hobbies. The online life can gain you much needed help and knowledge. 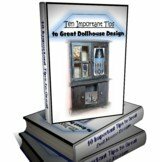 Even if you're not necessarily learning about dollshouse creation. Learning from woodcrafters who know their stuff is important too. Recently I joined a woodworking forum for the added knowledge it will provide me. Both in the projects available and the information provided inside the community. There are all sorts of ideas to consider with a wooden doll house. You can get anything from stained glass windows to iron fixtures to real hardwood flooring. So think up as detailed a structure as you like. Also consult period books and historical information on antique houses if you are creating a building from any period in history. Houses from different centuries changed the way they were constructed so it is good to study the differences before you start. This may be important if you are wanting an authentic model. With an authentic period model you run into problems like not being able to find miniatures for every period you may wish to produce. Because of this it may be necessary to pick a period and go for the feel of the period and not complete accuracy. Dollhouses are after all dream houses to fashion as you, yourself wish. Putting everything from tiny fireplaces to elaborate balconies to common dining rooms in place for your imagination's pleasure. Go for the gold and create the wooden doll house you have always wanted. For those who are looking for a ready-made wooden doll house check this link. As stated above woodworkers are the best people to hangout with when looking to learn how. Study the following books and magazines for great tips and ideas to take your abilities to the next level.